Scientists have created an iron-based ring structure that could be used for new applications in electronics and sensing. Ferrocene is a molecule that was discovered in the 1950s. It is made up of two rings of hydrogen and carbon bound either side of an iron atom. This and other 'sandwich compounds' have unique properties that have led to their widespread use as industrial catalysts, pharmaceuticals, and fuel additives. 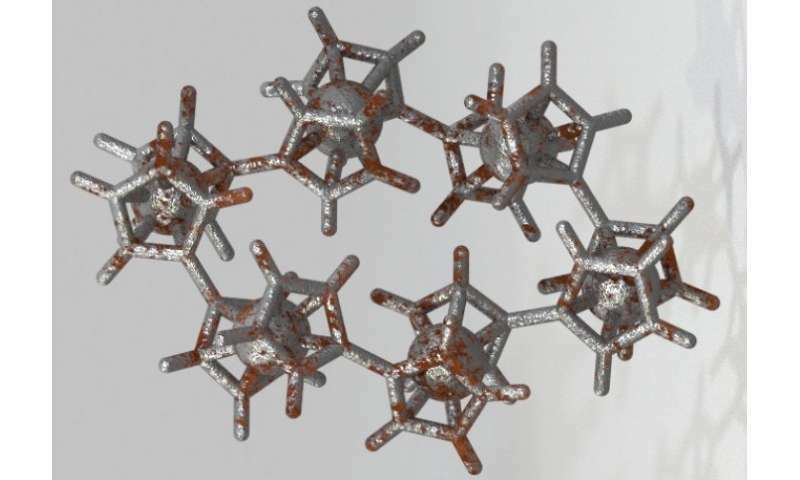 Now, a team of researchers from Imperial College London and the Universität Konstanz in Germany have created a series of rings containing ferrocene molecules directly linked together for the first time – forming a molecular 'daisy chain'. The cyclic structures have unique electrical properties that could be used in new electronics and sensing devices. When the team investigated the way electrical charge is handled by the rings, they discovered that interactions between individual ferrocene units resulted in an unusual charging behaviour of the entire ring. The research was funded by The Leverhulme Trust and is published today in Nature Chemistry. Adjusting the charge on one ferrocene unit causes the other units in the ring to re-arrange their charges without actually transferring the charge itself. This would avoid heating the molecules as the charge passes through, as happens with conventional electronics. This is similar to the way some small metal nanoparticles behave. The properties of these nanoparticles mean they are being investigated for use as 'molecular switches' in new types of computing. However, the use of nanoparticles is limited as it is difficult to produce particles with exactly the same shape and size, and hence the same properties. Co-authors Professor Nicholas Long and Dr Tim Albrecht from Imperial's Department of Chemistry said: "We see applications of these ferrocene ring systems in memory or switching devices. When we manufacture ferrocene rings they are all identical, as opposed to some existing nanomaterials. "This would make them much better candidates for molecular switches in computing, as the way they react to different charges would be exactly the same each time." Key to the discovery of these new materials was the use of an improved process to directly link ferrocene units together, although it would still be costly to produce them in large quantities at present. The team originally set out to create a 'molecular square', a compound containing four ferrocene units (one ferrocene at each corner), but discovered that their process had actually created a ring containing six units. They later developed methods to prepare rings containing between two and nine ferrocene units. The study's first author Dr Michael Inkpen from Imperial's Department of Chemistry said: "Given that there has now been over 60 years of research into sandwich compounds, it was thrilling to uncover a new family of ferrocene-based materials with such remarkable properties. Whilst they are structurally quite simple, to the eye of a chemist they appear rather beautiful." The 'sandwich' structure of ferrocene was originally worked out in part by Imperial's previous chair of Inorganic Chemistry Sir Geoffrey Wilkinson, who won a Nobel Prize for his work in the area. The discovery of ferrocene led to the study of sandwich compounds with different metals, and inspired many to explore this and related topics in chemistry. The researchers will now continue to investigate the electrical properties of the ring structures and how they might be used in computers, catalysts and other nanomaterials. Hmm, Atomic sandwiches, now what, Fractal Doilies and quantum cups?